First I needed to install XQuartz on my Mac. XQuartz is an open-source version of X.Org X Window System for OS X. Once installed we can ssh into the Beaglebone and use the -X switch to enable X11 forwarding. 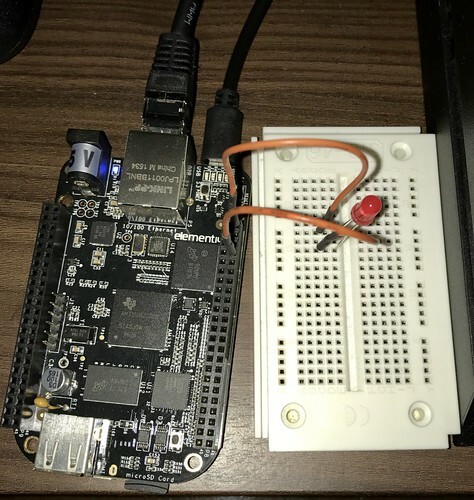 On the Beaglebone we want to use Python 3 with PyQt5 (which is a Python port of the Qt framework). So we might need to install both. Also we want Adafruits BBIO package to control the Beaglebone GPIOs via Python. Now we've got everything we needed an can write a little python script that allows us to switch a LED connected to GPIO_67 which is PIN 8 on Port 8. See the BBB Pinout here. We create a new file app.py containing the following Python code. After a short time a new Window should have opened on our Mac (or any other client) showing the GUI. Clicking on the buttons should now let the LED switch on / off.